Snrky: But he's free to call me Master Chief. But he's free to call me Master Chief. 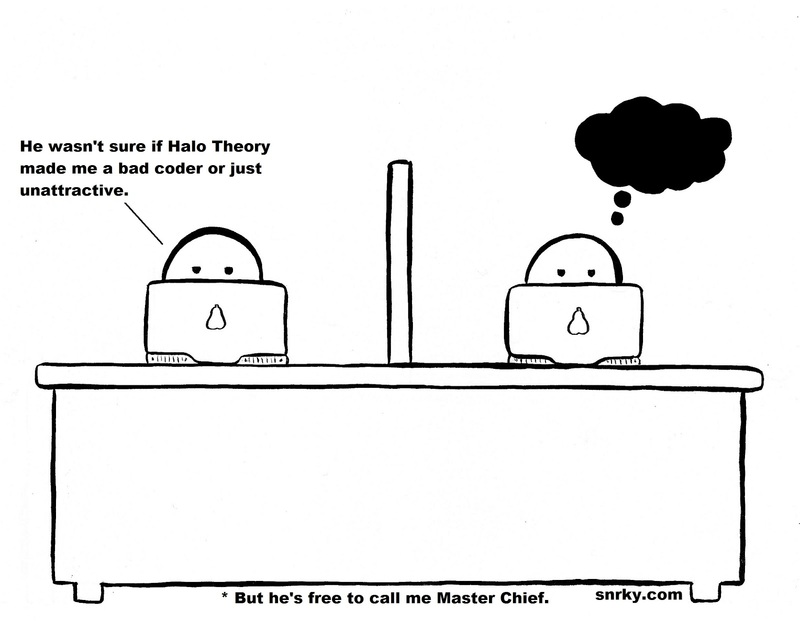 I've always wondered how much halo theory or halo effect plays into work as a developer. Are you presumed to be a bad coder if you're not attractive? Or is there potentially a reverse halo effect in place and you're presumed to have more coding time and be better at it if no one is attracted to you? Are business folks considered to be particularly effective if they're more attractive? Does it have anything to do with who's put in front of customers and who's relegated to the loneliness of a cube? Title: But he's free to call me Master Chief. Snarky: He wasn't sure if Halo Theory made me a bad coder or just unattractive.